We are proud to announce an art opening and book preview with local artist Paul Guinan and writer Anina Bennett, who will be special guests at this year’s Comic-Con International. Portlanders can meet them–without traveling to San Diego–at the TFAW Hollywood location at 4133 NE Sandy, Portland, OR, June 24 from 7 to 10 pm. Guests are invited to view an extraordinary collection of pieces while enjoying complimentary food, beer, and wine (with valid ID). The art show will feature a selection of prints and a rare display of toys and artifacts from Paul and Anina’s Emperor Norton Award-winning book, Boilerplate: History’s Mechanical Marvel, which was recently optioned by J.J. Abrams (Star Trek, Lost). The exhibit will also include a sneak preview of artwork from their upcoming book, Frank Reade: Adventures in the Age of Invention, the chronicle of a family of steampunk inventors. In addition, Paul will present the first public showing of an elaborate model of Frank Reade’s electric battle-wagon, Valiant, which he built for the new book. Copies of Boilerplate will be available for purchase and signing. 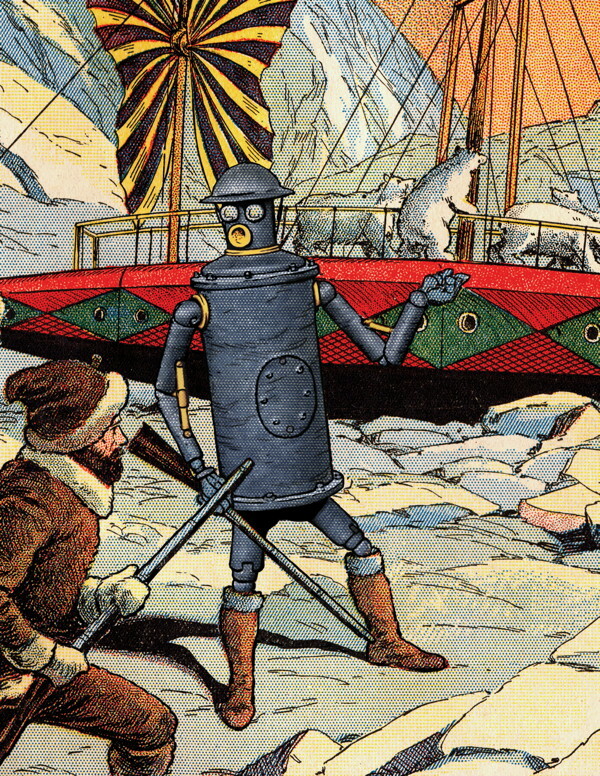 Boilerplate is a fictional “historical” book about a mechanical man, a prototype soldier, that’s built during the 1890s and has adventures around the world up through World War I. Featuring Guinan’s extraordinary artwork incorporated into real-life photos–for example, Boilerplate meets Teddy Roosevelt and Pancho Villa–Boilerplate is so authentic, many people have been convinced that the robot actually existed. Writer Anina Bennett is is a recovering comic book editor, having previously shepherded titles such as Star Wars, Nexus, GrimJack, and Harlan Ellison’s Dream Corridor for First Comics and Dark Horse Comics. She and Paul created the Eisner-nominated science fiction series Heartbreakers, one of the first comics to feature clones and female action heroes. Visit them online at www.BigRedHair.com. Multimedia artist Paul Guinan started out at First Comics, retouching the first manga translation published in the U.S., Lone Wolf and Cub. While at First, he co-created Cargonauts, a precursor to Firefly. Paul also co-created Chronos for DC Comics and was lead background artist on the animated series Stan Lee’s Stripperella. He is a founding member of Portland’s own Periscope Studio, the largest comic book studio in North America. Are you excited to see these prints and artifacts? Have you read Boilerplate yet? Post your comments below!